Francis Kelly Swing and Rat Pack Singer has style, quality, and class. Francis is the ultimate professional singer. He is laid back and cool as a mountain stream. 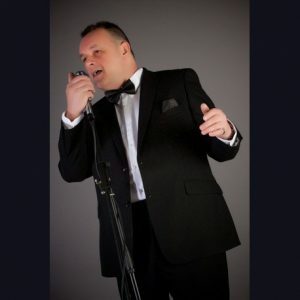 Francis sings all the classic songs from the golden era of the Rat Pack, Nat King Cole and the more contemporary singers like Robbie Williams, Michael Buble and Wet Wet Wet, Francis will deliver a set to suit the occasion. With his cool and laid- back style, Francis is perfect for Weddings, Corporate functions and family celebrations. He will tailor his show to suit the requirements of the client to ensure all your guests have a fantastic evening. For weddings a first dance request is also very welcome. He uses only top- quality sound system and stage lighting and uses the very best backing tracks, it really does sound like a big band backing him. Francis is a vastly experienced singer & musician. He was the drummer with top Scottish showband Silverbird. The band toured the UK including the tough clubs in the Northeast of England, Yorkshire and South Wales appearing with top acts like Matt Munro, Bradley Walsh, Allan Stewart, Dougie Small and Andy Cameron . Moving to mainland Spain 10 years ago for the quiet life, he ended up performing from Benidorm to Marbella. Now he is back doing what he has always dreamed of, singing swing and as you will find he does it rather well.